Philippine security forces have tightened security after a blast at a restaurant in the southern Philippine town of Isulan in Sultan Kudarat province wounded at least 18 people on April 3. Major General Cirilito Sobejana, Commander of the army’s sixth Infantry Division, said that the force has intensified their intelligence operations in order to apprehend the perpetrators and thwart further hostilities. Sobejana said the military, in coordination with local government officials and other stakeholders, are working to bring back normalcy in Isulan. The military has not yet identified the group behind the blast and the motive for the restaurant attack. Mayor of Isulan city Marites Pallasigue said the bomb was placed at the back of an air conditioner, shattering a window at the front of the eatery. Most of the victims were related to each other. Police cordoned off the scene for investigation. Sobejana said the attack may have been carried out by Muslim militants belonging to the Bangsamoro Freedom Fighters. The explosion happened just a few metres from the site of a deadly blast which occurred last year and was believed to have been carried out by Islamist militants. 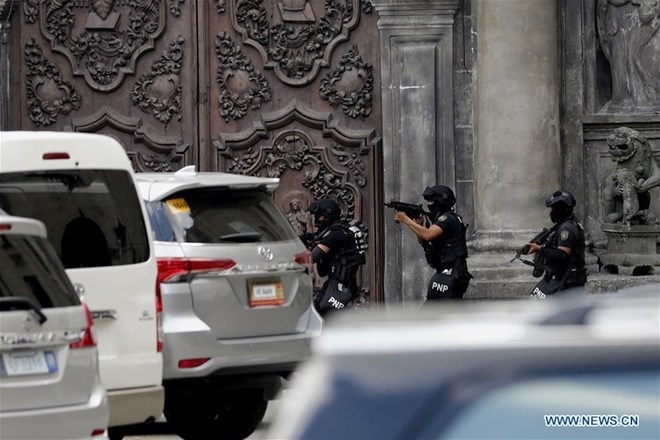 On an island to the south of Mindanao, an IS-claimed attack on a cathedral during a mass killed 21 and wounded about a hundred others in January this year.